Condition: both cups are in good condtion. The first has a small and shallow chip inside the rim which appears to be under the glaze and was probably introduced during manufacture, and a small amount of roughness to the foot. It has some kiln grit adhering in the glaze in the interior. There is some light rubbing to the extremities of the coat of arms. The second has firing flaws to the glaze on the interior and exterior. The glaze on the exterior is slightly darkened during firing, and has some fine kiln dust adhering. On the interior the glaze has been applied thickly and has formed visible runs. There is a thick blob of glaze at the rim whcih can be seen in our photographs. This is not damage, but a manufacturing flaw. There is a small glaze frit to the foot, and a short firing crack to the top of the handle (which does not extend through the handle). 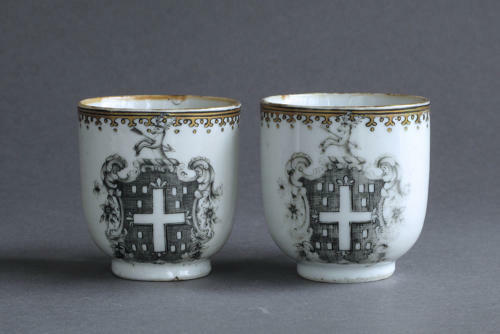 The grisaille decoration on ths cup is a good stong colour with minmal rubbing.